Will Link has always been a storyteller. Born on Long Island, reluctantly he moved west to Los Angeles, pursuing a career in screenwriting. He took to L.A. faster than any self-respecting New Yorker should and, 10 years later, still calls it home. Since then he’s worked as a film critic and on-air host for Afterbuzz TV. There, he also discovered the world of personal comedic essay writing and has performed pieces in shows across the country. He finds this medium successfully combines his love of writing and hearing the sound of his own voice. Listen to him weekly, breaking down all things pop culture on his mildly popular comedy podcast Will Sean Podcast? which you can find on iTunes. 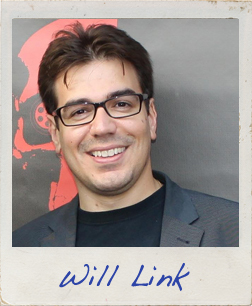 Follow him on Twitter @TheRealWillLink. Read the first page of Will’s story!